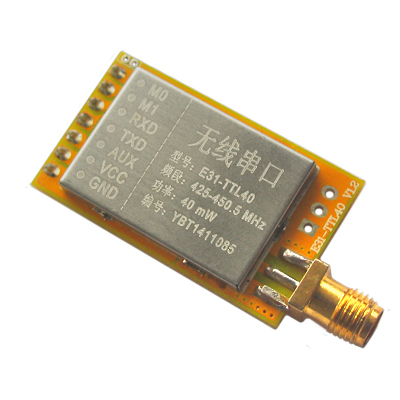 RF-TTL-40-SMA is our latest 100mW wireless transmission module. It working in 425-450.5MHz band and using serial port to send or receive data. Its advantage is that centralized power density, transmission distance(Its transmission distances can reach 2100 meters.) and strong anti-jamming capability. It can be comparable to most of the 200mW module in current market. 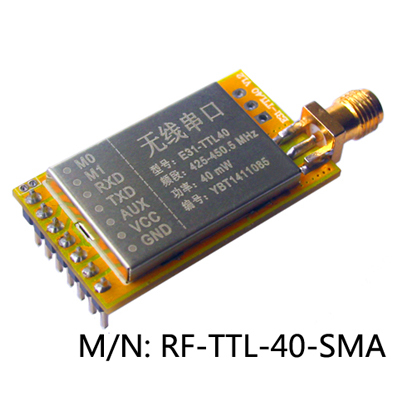 RF-TTL-40-SMA having the FEC forward error correction algorithm, the coding efficiency is higher and the error correction capability is strong. When in the case of burst interference, it can take the initiative to correct the interference packets , that greatly improving the reliability and transmission distance. The module also having data encryption and compression function. When transmission data in the air, it is random and unsafe. But after the module rigorous encryption and decryption algorithm, the data interception becomes meaningless and improves transport security. 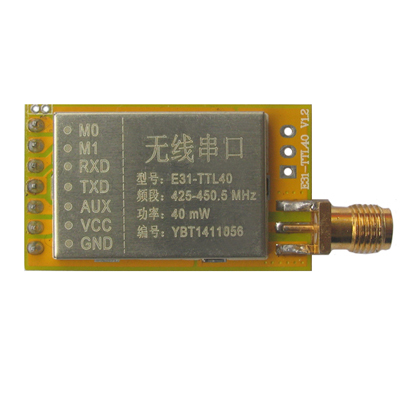 The module has four operating modes , and can freely switch at runtime , in the power saving mode , current consumption is only ten of uA, it is very suitable for ultra-low- power applications.